Yes I personally find the aforementioned site really is hellish expensive. I think it’s a ‘human nature’ thing and once a couple of bids go in then it becomes a personal battle to win. I am fortunate in that I live within easy reach of two decent toy fairs and virtually all my Hornby Dublo has come from two of the regular dealers. I am thankful that I am able to access and barter with the dealers and most importantly I can touch and check what I am about to shell-out on. Some of the items listed on eBay are often described as mint, when at best they are spares or repair. The prices fetched for some items are staggering and the postage charges are not helpful either. 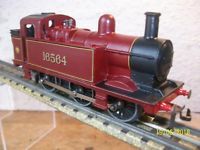 You can buy virtually anything Hornby Dublo on eBay but it does come at a cost.